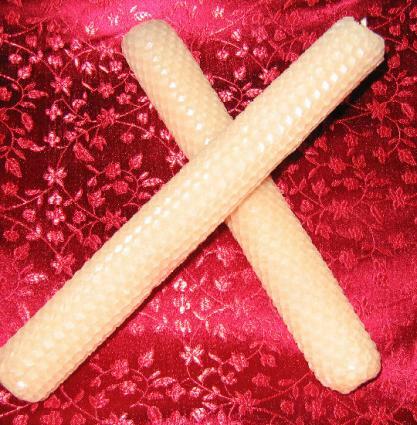 Beeswax candles are beautiful and simple to make. In fact, they are the one candle project that your children can do without adult supervision, because you don't even need heat to make a beeswax candle. Beeswax is actually tiny scales of wax produced by bees, almost like sweat made from sugar syrup or honey. Bees have to consume 10 pounds of honey to make one pound of beeswax. Beeswax can often be found in sheets with a honeycomb pattern on the outside. You can also buy it in blocks and use it like traditional paraffin wax. For the purposes of this article, though, we're going to talk mostly about those sheets of beeswax. You can find them in all sorts of colors. They are usually unscented. The easiest way to make a beeswax candle is to use one sheet of beeswax. Cut a length of wick a little bit longer than the width of the wax (or the length, depending on which way you're planning to roll). Experts recommend using a 1/0 square waxed wick for beeswax candles, but any wick recommended for smallish candles will work. Using a wick that's coated in wax helps the wick stand up, stay straight in the candle and burn well. Start at one edge of the wax sheet. Lay the wick down along one edge of the wax, and slowly roll the wax up on itself. If the wax is stiff or tries to break when you try to roll it, warm it up using a hair dryer on the low setting. When your candle is all the way rolled up, you'll want to squeeze it gently to make sure the outside edge sticks to the rest of the candle. This isn't hard to do, the warmth of your hands should be sufficient to stick it. Instead of using a full sheet of beeswax, you can cut it in half and make a pair of shorter candles using the method described above. Or cut a piece of beeswax along the diagonal (if you have a rectangular sheet, cut it down the middle but on the diagonal, so that there are a couple of inches of uncut wax along each edge). Start rolling from the flat straight edge and you'll make a tapered candle. You can also do the same thing and stack sheets of two different colors to make a layered taper candle. Or cut two sheets of different colors, press them back together so you have two sheets that are two different colors, and roll as usual to make a striped candle. You can also make stacked or "flat" candles with beeswax. To start, get a sheet of beeswax and a cookie cutter of whatever shape you like (a star, a heart, a flower, etc.) and cut out a bunch of shapes. You can make them different colors or all the same, whatever you like. Then thread the wick through the hole, pressing the wax back around the wick to hold it in place. Alternatively, you could poke a hole in the middle of each piece before you stick them together and thread them onto the wick individually. Once you start playing with beeswax, you will discover all sorts of ways to make pretty candles fast. And they make great gifts, too.